I like to think I really found something of the heart of this 1,000 year old country out in the countryside, especially in the hills and forests of the least visited regions. I spent two summers exploring the Northeast, following trails that threaded through beech woodlands in the Bukk mountains, tiny villages in the Zemplen Hills, skirting ruined castles, and visiting a few in good repair. The area is now, of course a frontier with Slovakia and Ukraine, although historically Hungary laid claim to large chunks of both, (along with Transylvania in present day Romania to the south). As a consequence the maps of the area were littered with distortions, absences and tracks that petered out – this is common in any border country, but can make trail planning a little haphazard. Near an abandoned border croft a fig tree offers an ideal location for a picnic. Check first for snakes hunting rodents ! What I encountered was like stepping back over fifty years, to a bucolic idyll of hand pumps in the village centre, gardens full of home grown produce and orchards with successions of fruit. Cattle often roamed through the woods and along the streets returning for milking; bullocks were still to be seen hauling a plough or a cart and rosy-cheeked farmers’ wives offered fruit or wine across the garden wall to refresh visitors. (No kidding !) 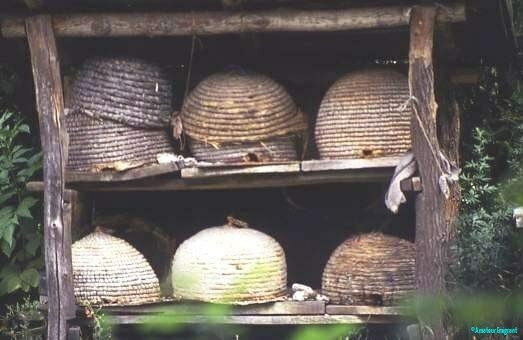 I came across beehives and houses that seemed medieval, but were really exemplars of thrift balanced against shortages, making the most of every resource available in a rural economy only partially touched by monetary currency. Hungary claims to have been one of the first countries to establish nature reserves, not just for the wealthy to hunt in. It was recognised from very early on that the country lay at the crossing of east-west and north-south migration routes for many bird species, and remains a magnet for twitchers. The northern hills were certainly recognised as something special, many trails were established ensuring the restorative value of nature was instilled in young pioneers. Even during the years of the Soviet Union small cabins were placed in the countryside to encourage wanderers, and to this day the Hungarians retain an almost mystical attachment to their countryside. Venture there and you’ll find people collecting acorns and beech mast for pigs, figs from abandoned allotment trees, mushrooms in season for drying, and also seeking the wild boar which thrive in thickets, emerging to devastate unguarded gardens. I found it astonishing that everyone I encountered had a seemingly comprehensive knowledge of their history, (compared with my compatriots). Any Hungarian I met could have named 10 or more Hungarian poets, novelists or playwrights, scientists, knew the words to a dozen songs about some deed of valour, or a romantic encounter. Their grasp of a clearly Hungarian place in history was undeniable, as was the robust pride with which they demonstrated it. Hungarians have their issues in the modern world, and history shows this is not new. They will reel off the failed Mongol and Ottoman invasions, the reckless expansion of the Hapsburg Empire, then crushing defeat of rebellions against them and later the USSR, for which the west has never been forgiven, repeated again when a poverty stricken country needed assistance after the fall of the Soviets. Help was always promised, encouraged even, but never forthcoming; one can empathise. They were always among the most liberal of the Soviet satellites, but in the free world they have emerged as being fearfully xenophobic. Where next ? One is forced to ask.